Actor-comedian Jim Carrey took to Twitter on Tuesday to share artwork targeting Facebook over reports that the social media network allowed third-party analytics firm Cambridge Analytica to access millions of its users’ data during the 2016 election. 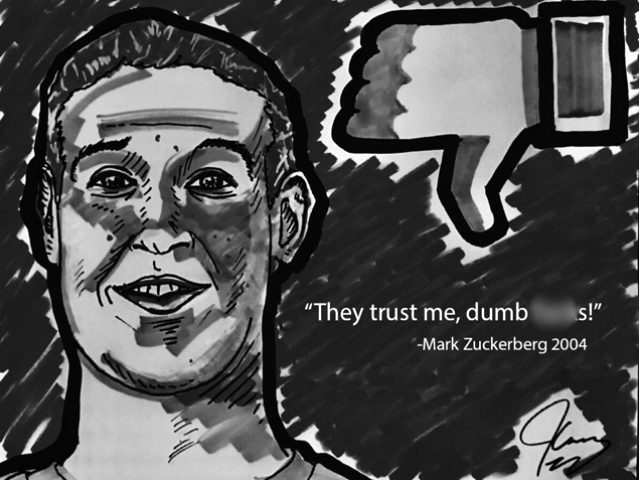 Carrey’s painting features a photo of Facebook funder Mark Zuckerberg with a caption of a quote of Zuckerberg calling people “dumb fucks” for trusting him with their personal information when Facebook first launched at Harvard University. Carrey — who regularly attacks President Donald Trump and members of his administration — was just one of several celebrities criticizing Facebook and Zuckerberg after reports that the platform shared personal data of 50 million of its users with third-party entities, and allowed former Obama presidential campaign staffers to harvest Facebook users’ personal information. “Screw u mark zuck #deleteFACEBOOK,” wrote Rosie O’Donnell in a tweet. O’Donnell also signaled that she’d deleted her Facebook account. I don't know how anybody can continue using Facebook. Are you even going to comment on this, Mark Zuckerberg?! On Monday it was reported that the Federal Trade Commission (FTC) is investigating claims that Facebook allowed Cambridge Analytica, a London-based data mining and data analysis firm, access to its users’ data during the 2016 election.